The Vortex fill pass diverter provides a versatile method for filling one or more in-line weigh hoppers when material is conveyed pneumatically through a closed-loop system. 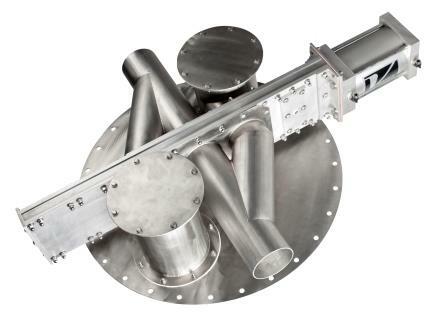 The fill pass diverter can be used to divert material flow of non-abrasive to moderately abrasive powders, granulars, or pellets in a vacuum or dilute phase pneumatic conveying system with pressure up to 15 psig. The diverter allows the convenience of continuous conveying, without having to shut down the conveying line to shift ports. The fill pass’s design utilizes spread hopper inlet/outlet stacks and a positive seal for improved air and material separation reducing fill time and down line material carryover. The diverter is stackable to accommodate multiple conveying lines in the milling, food, plastic, chemical, and mineral industries.